A Ridiculous price and yet the cheapest available, as Amazon are over £300. 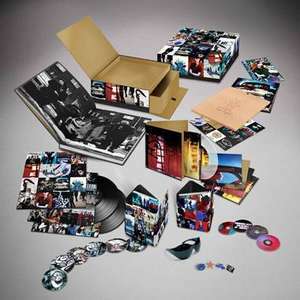 The Uber Deluxe Edition Box Set is a magnetic puzzle tiled box containing 6 CDs including the original Achtung Baby album, the follow-up album, Zooropa, B-sides and re-workings of previously unheard material recorded during the Achtung Baby sessions. 4DVDs including “From The Sky Down”, Zoo TV, all the videos from Achtung Baby plus bonus material. Also 5 clear 7” vinyl singles in their original sleeves, 16 art prints taken from the original album sleeve, an 84-page hardback book, a copy of Propaganda magazine, 4 badges, a sticker sheet, and a pair of Bono’s trademark “The Fly” sunglasses. I love the boys and their work, but this is a bit much. So I'll probably wait till it goes down like The Joshua Tree box went to £10. I love the boys and their work, but this is a bit much. So I'll probably … I love the boys and their work, but this is a bit much. So I'll probably wait till it goes down like The Joshua Tree box went to £10. I've asked Universal Direct to see how many of these are been produced, and you'll be suprised to hear that they haven't responded. I'm guessing they ain't that limited or they would have just come straight out with a number (in fact none of the new editions say how many are made). Best thing to do if you really want this, sit tight (about a year), it will fall rapidly in price. I think you could get this for around £120. OP - yes this is the best price, I stumbled across it myself yesterday. I also think they've made a huge mistake calling it the Uber box, as that would indicate the best, however in one of the other editions it comes with a bigger book and also you don't get the 2 remixed blue translucent vinyl's that come with the standalone vinyl edition, so not very impressive in my eyes when you look more closely at it. By the way HMV want £420 for this, crikey!!!!!!!!! Crazy Horse: Totally agree, I ordered the 360 box set when it hit half price with Universal, only to get an email saying it would be on back order. Straight away I thought how can a "Limited Edition" be on back order, surely they would have had to have already worked out how many were allocated to each store as their "Limited". So I cancelled it, and still haven't got it. was going to see if it came down any further first. But basically I think the same, any box set for anything is really only worth half the price it's initially going for, and as soon as it hits £120 or less then I'll buy. P.S. Again Yes I agree, it's not quite the "Uber" box set until it contains a few bricks of the berlin wall. A list of the drugs they took to write each song. The other Sydney show when Adam was so drunk he couldn't play, and macphisto's frilly red shirt.